By popular demand, I've amended this post to now include a free printable for use as a Party Favor! I couldn't help but stitch a few photos together so you could get a feel for how awesome the eruption is! S and I have erupted at least a dozen volcanoes just this week alone. They are so much fun to play with! *for my Aussie and UK readers (or anyone else) who can't get Kool Aid - you can substitute Citric Acid Powder (used in canning foods). I've written a separate recipe for you with that substitute at the end. You can get everything but the Kool Aid from The Dollar Tree - and you can't get the Kool Aid there because it's so much less than a dollar! Next you'll want to make the little pouches of Erupting Powder. I lay out a small piece of plastic wrap and then add all the ingredients on top of each other. You can mix if you want - but it's not necessary. Then I gather up all the edges and twist it and tie a bow around it with yarn/string/ribbon like you see below. 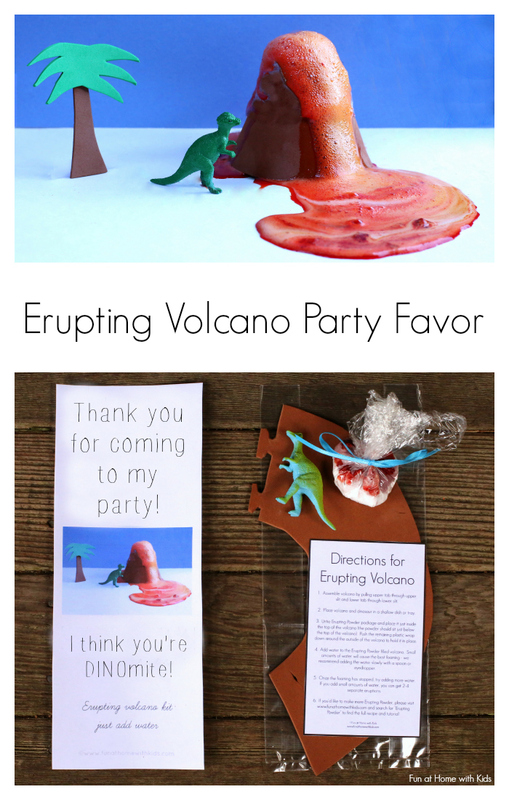 Print and cut out the Directions for Erupting Volcano and the Valentine Card or the Party Favor Card. In a treat bag or other bag of your choice (Treat Bags pictured below), add one dinosaur, one package of Erupting Powder, one foam volcano, and one set of directions. Staple or otherwise affix the bag of supplies to the valentine or party favor card and voila! Super awesome erupting volcano valentine or party favor! Brilliant Asia!! This is just Brilliant!!!!!! I can't wait to use this as a Dino Birthday party favor!! Thank you for another amazing activity. Oh. My. Gosh. I *LOVE* this!!!! We just joined a new homeschool group and this might be the first year in awhile that we have to give valentines. Something like this would be perfect! Can I just say this is the coolest Valentine I have ever seen? LOVE, LOVE, LOVE! How many volcanoes are you able to make out of one sheet of foam? Can't wait to do this for my son's daycare class! YAY! I'm so happy you're going to make some! They really are SOOOO fun!!! The really small sheets of foam from the Dollar Tree only make one volcano per, but the larger 12x18 sheets of foam you can get at craft stores make five per sheet if you position them just right! 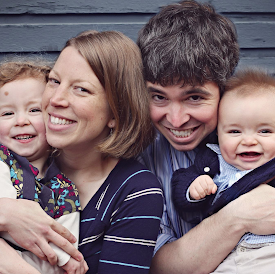 Do you know how many you can fit on the 9x12 sheets that you linked to at Amazon? I believe you can fit 3 if you put them really close together, Melissa! Hope that helps! LOVE this. I reshared on G+ and just shared on my FB page. Hope to make this for my sons! SO.MUCH.BETTER.THAN.CANDY. I am totally doing this! 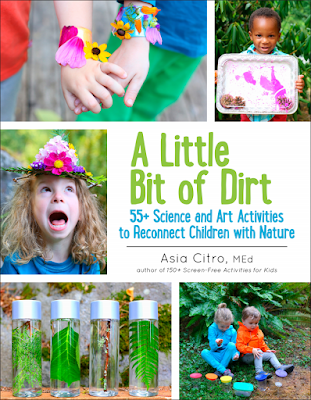 Could I use the citric acid and add a drop or two of food coloring? I'm worried the kook aid smell would attract small ones to taste it. I guess it wouldn't hurt them and it would taste bad. I just avoid buying Kool Aid. Yes follow the directions above for substituting citric acid for Kool Aid. 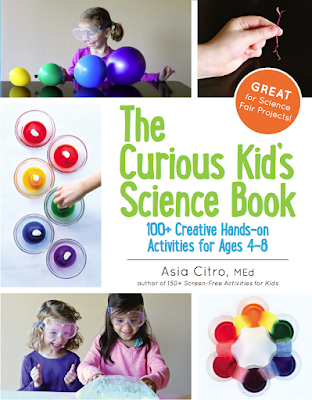 As far as food coloring, you could add one drop to the baking soda and mix well before adding the citric acid, but there is water in the food coloring and it will cause some of the citric acid to react. I'd say if you're going to add food coloring, go with one single drop, well mixed, and then double your citric acid to be on the safe side! Hope that helps. Would Jello powder be an ok substitute? Just got back from the store to get Kool Aid (and tonic water for glowing snowman globe) Yay-now we can try a bunch of your ideas tomorrow! Thank you! Started my shopping list! Everyone at daycare will get one! How many volcanoes can I get out of one foam sheet? Awesome! Around 4-5 per large 12x18 sheet. Hope that helps! :) So excited!!!! Just wondering if the liquid dish soap has enough water to start the reaction... how far in advance can I make the erupting powder packets? Any idea how early you can make these before using? I did a test run and it looks like it was starting to foam on its own?? I am sooooo excited to have found a Valentines gift for my little man's 1st grade class in lieu of candy!!! :) Thank you! Do you make one recipe of erupting powder per valentine? Do I need 1 packet of kool-aid per valentine? Hi Jennifer! Yes, one recipe of erupting powder per valentine. 1/2 to 1 packet of Kool Aid - your choice. 1 packet will cause a longer eruption, but 1/2 causes a great one - less than 1/2 a packet doesn't work quite as well. Hope that helps! How much is a "squirt" of washing liquid? And did you use red? Around 1/16th of a teaspoon, I'd guess. It's definitely something that has wiggle room! I used a combo of red and orange Kool Aid in the volcano shown (our soap isn't really colored) - any color would be cool! :) Hope that helps! Asia I've featured your one of a kind Volcano Valentine at MSN Living in the Family and Kids Section! 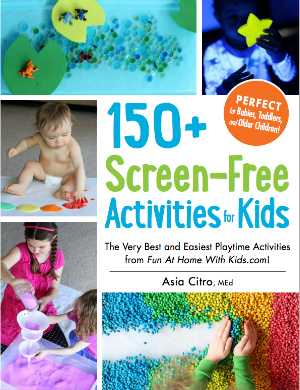 Thanks for sharing your adorable idea on Pinterest! I can't wait to try this out with my girls. Thanks! Hi! Does the volcano have to be foam paper or do you think I could get away with using construction paper? I imagine the eruption would make paper soggy, but maybe the soggyness wouldn't be that bad until aaaafter the eruption is over?? I'm SO excited to do this!! -Amber M.
Ive done it it before and yes it did for me. do you mix the ingredients in the bag? My son loves dinosaurs and is super excited to hand these out to his friends on his birthday! I bought the big can of kool aid and was wondering what is the conversion of one packet into tablespoons? Thank you so much in advance! Oh, yay!!!! How fun! As far as the can --- I'm afraid it may be a little problematic because it has so much sugar. You can check to see if I'm correct by reading the ingredients, but as I understand it, the cans are just a few packets of Kool Aid + the several cups of required sugar. I'd go by how many quarts it says on the can - a packet makes 2 quarts, so if the can says it makes 34 (that's what the ones I'm seeing online say), you'd want to add about 1/17th of the can mix. If you're able, I'd double check that the sugar doesn't interfere with the reaction (I don't *think* it will, but since I've never tried it, it would be worth checking). If you can still return the can for the packets, that will be easier, since then you won't be dealing with the sugar they dump into the can. PHEW! That was a long answer. Hopefully it's helpful!!! And happy birthday to your son! My 6 year old is CRAZY about volcanoes!! We watch Dante's Peak every night, and have for the past 4 months! (Thank God for Pierce Brosnan or I couldn't do it!) He is going to LOVE making these for his classmates! Of course, I am sure, we will make dozens for him! Thank you so much. I have a five year old who loves volcano's! Thanks can't wait to make for his class! Do I have to use soap? The bags are expanding like crazy from reacting with the soap in it. Oh dear! Don't know about you guys, but here in Canada Kool-Aid packets seem to be getting pushed out of the grocery store. (They've been replaced with liquid concentrate - I guess we're too lazy to stir. :P) If you see any buy them up! Oh no! You can always substitute for citric acid (there's a recipe for that above). But bummer about the Kool Aid packets! ACK! These are fantastic! My son said he wanted his Valentine to say "I lava you" and when I found your volcano, he was sold!!! I started to make them today and did have some of mine start to react... although that could have been my overzealousness of the "squirt" of dish soap. I wonder if a powdered soap would work so there is liquid involved at all! Thanks for sharing your creativity!! This is such an awesome idea! I made these with my daughter for her school Valentines this year. She is in Kindergarten and was able to help measure out ingredients and assemble the bags, such a fun project we could do together! One thing I did differently is I used the cheapo sandwich bags for the eruption powder...plastic wrap is the bane of my existence (lol) and after struggling with it for the first few I found the plastic baggies worked much easier. Of course we had to test one out (so much fun!) the water worked great with the mix, but we decided to use some vinegar as well and Whoa! did we get an eruption then! 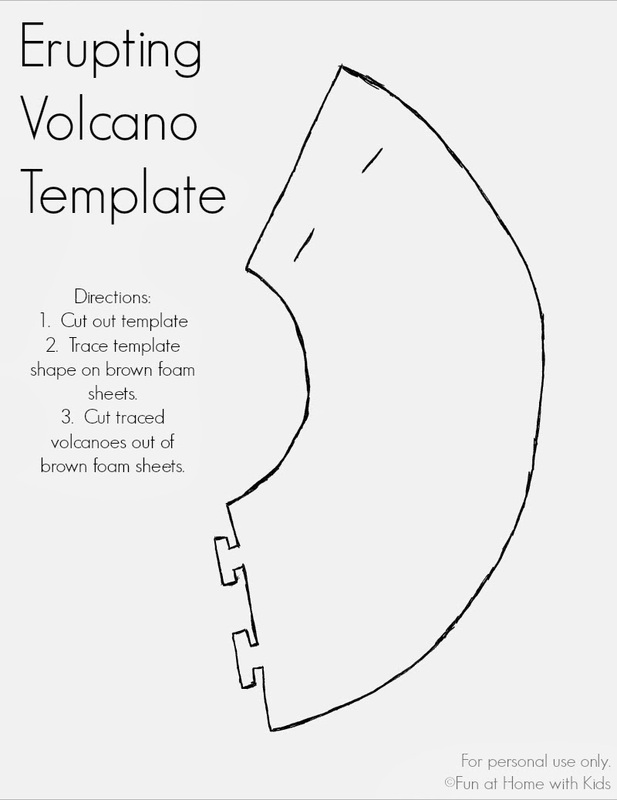 Hi There.Could you please guide me as to how big the volcano should be?I printed out the template as is,and it seems really small.Was wondering if I printed it incorrectly :(.Going to try is soon with my 4 year old who is a dino fan for sure!Thanking you in advance.